As comedian Mel Brooks and rocker Tom Petty reminded us in movie and song, it’s good to be king. LeBron James undoubtedly would agree. In fact, King James can give you 154-million reasons why it’s not merely good but great to be the reigning monarch of sports after signing a contract with the Los Angeles Lakers for that many dollars Sunday night. Nice compensation for shooting, dribbling, passing and rebounding a basketball. James’ annual salary is 641 times more than the average American’s. Should he suit up for all 82 games next season—something he’s done just once during his stellar, 14-year National Basketball Association career—he would average $469,512 per outing. Yes, that’s insane, but, hey, that’s what the market bears in this crazed culture of celebrity we’ve created, where a far greater monetary value is placed on athletes and entertainers than on the people who teach our kids or nurse our ills or pick up our garbage. Interestingly, James could have grabbed even more cash had he stayed put and continued playing in Cleveland. After all, the Cavs offered him a five-year, $205-million deal, which would have made him the richest player in NBA history. But LeBron decided to shout “hooray for Hollywood” and live in the two mansions he owns on the left coast. In his Instagram farewell to Cavs fans, the four-time league MVP and 14-time All-Star posted a photograph from Cleveland’s 2016 championship parade. The Akron, Ohio native said the Buckeye State would always be home. Though upset about James’ latest departure, Cavs fans haven’t been nearly as combustible as they were in 2010 when James announced he was “taking his talents to South Beach.” That rub-sand-in-your-face exit to Miami, Fla. was greeted with bonfires in the streets of Cleveland as LeBron’s reputation and hundreds of his No. 23 jerseys went up in flames. After winning two titles with the Miami Heat in four seasons, he returned to Cleveland, and triumphantly delivered on his promise to win it all for his hometown, thus ending the city’s 52-year championship drought. And he did so in dramatic fashion, as the Cavs became the first team in NBA history to storm back from a 3-1 championship series deficit. LeBron would lead Cleveland into three other Finals, but would be stymied each time by his nemesis, the Golden State Warriors. At his homecoming, he said he wanted to finish his career with the Cavs. I suppose that could still happen for the basketball royal, who turns 34 years old on Dec. 30. But it might have to be one of those one-day, ceremonial contracts five years from now. LeBron might even give the Cavs a home-town discount on that one. Say, sign for a dollar. Look, I understand why Clevelanders are disappointed with his latest departure. Sadly, this is the sports world in which we live. The days of a Cal Ripken Jr. playing his entire career with the same team have gone the way of laces on basketballs. The kings call the shots. The subjects have no say. And, so, LeBron is off to land of glitz and glitter to continue his one-on-one game against the legend of Michael Jordan for the title of greatest of all-time. The Warriors, who have won two consecutive NBA titles and three in the past four years, remain a massive road block in LeBron’s way. Their core players are in their prime. The Lakers, meanwhile, are coming off a 35-47 season. The newly nicknamed “L.A.-Bron” is going to need reinforcements to challenge the Warriors and Houston Rockets. Over time, Ohioans’ anger will subside. They’ll reflect on the championship he delivered. They’ll salute him for donating $41 million in college scholarships and for pumping tens of millions of dollars into the local economy. And once he retires, they’ll show up in droves to witness his jersey being retired rather than burned. Adoring subjects will treat him royally. It will be good to be king. If you saw those photographs of a sculpted Jerry Rice in the recent issue of ESPN The Magazine, you’d swear that the 55-year-old could still play wide receiver in the NFL. Rice claims he could. Rice made his bold assessment after practicing with his old team, the San Francisco 49ers, last year. “The young guys could not believe it—after playing a game for over 20 years and being out of the game for almost 15 years, I think that really impressed them,’’ he said. Undoubtedly, they were impressed that a 55-year-old former player was in as good as shape as he was. But Rice would do well to stay retired. There’s nothing left to prove for a wideout whose NFL-record 22,895 receiving yards are 6,961 more than Terrell Owens, the No. 2 player on that list. A video of New York Yankees outfielder Aaron Judge playing catch with a boy in the stands between innings went viral last week. This is something that Los Angeles Angels outfielder Mike Trout has done for several years, and something I wish more ballplayers would do. These kind gestures take little effort and go a long way in making a kid a fan for life. Very good column. Thank you Scott. 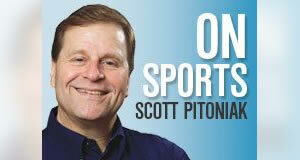 Scott, great article, don’t understand a player like LeBron coming and going like a revolving door. Money talks I guess. I mite remind you, Mr Jeter, one of my all time Yankees, and there are many, played only on one team as Cal. But you are correct, loyalty is a lost charactistic in today’s sorts world. I agree with you 100% on Jerry Rice, stay retired and looking good.